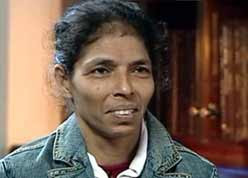 BRAVEHEART: Indian nanny Sandra Samuel may be given Israeli citizenship to be with baby Moshe. The world knows her as the daring nanny who, clutching a two-year-old boy, pushed past the havoc in a terrorised Mumbai and risked her life to keep the toddler safe. The nanny says she came face to face with a gunman late Wednesday, the first night of the siege. "I saw one man was shooting at me -- he shot at me." "When I hear gunshot, it's not one or 20. It's like a hundred gunshots," she added. "Even I'm a mother of two children so I just pick up the baby and run. Does anyone think of dying at the moment when there's a small, precious baby?" In the aftermath of the attacks, Moshe asked for his mother continuously, Samuel says, and he is learning to play again -- though he likes the nanny close by. And while she still has nightmares of the horrific siege that took hold of Mumbai, Samuel, a non-Jew and native of India, said she will stay in Israel for as long as Moshe needs her. CNN: Tell us what happened. Samuel: I was in the kitchen. I came running to stop them and I saw one man was shooting at me he shot at me, it was like something I don't know but still in that time I could shut the door I lifted the phone, I could hear rabbi speaking in second floor, everyone speaking at once, then I knew there was some problem, I put the phone down and took out that wire because I didn't want that phone to be ringing. Samuel: That's it, I was in the storeroom hiding like a coward, I don't know. Samuel: It was until next morning when the baby called me. When I went, Moshe was next to his Ima (mother) standing and crying out my name, that's what I know. CNN: What were you thinking, what went through your mind? CNN: But you saved Moshe, how was he when you picked him up? Samuel: When I picked him up he was quiet, that's why I could bring him out, I don't know if somebody else was there. May be he'd have created a racket. Just because it was me and he's been with me that he didn’t cry. CNN: Did you know where the gunmen were? CNN: Were you scared as you ran out of the house? Samuel: Scared no, I was like just take the baby and run, frankly I don't even know what I was thinking, I just picked up the baby and I ran and that other worker Jackie was with me and we ran like mad. When I heard gunshots, not one two but hundreds of gun shots, 10-20 grenades, in the Chabad I just picked up the baby and ran. I don't think of fear. Does anybody think of dying at that moment when a small precious baby's (around)? No. I have dreams, nightmares actually, about this -- me sitting between the fridge and another worker sitting by the fridge and we want to do something but we can't do anything and we go to the window and as we come out they bomb the glass has been shattered everywhere. CNN: How are you coping? Samuel: Me? Baby's there that's it.